Born in 1850 in Bischofswerder, West Prussia (now Poland), Franz Poenitz made his name as a harpist, performing and touring as a child prodigy from the age of six, before spending most of his adult career as a chamber musician at the Berlin Royal Court Opera. He began studying composition when he was 11, and continued to write music throughout his career -- focusing primarily on works for the harp and harmonium, of which he was also a virtuoso. 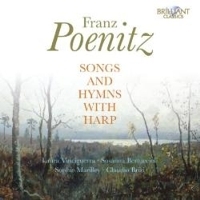 Although Poenitz's compositions never achieved widespread fame and were forgotten during the course of the 20th century, this fantastic new collection demonstrates why his works -- particularly those for harp -- are experiencing a revival of interest. In the eight pieces, Poenitz's experience as a virtuoso harpist is evident; he makes full use of the instrument's timbre, colour and lyricism to create evocative music of great delicacy. In Spukhafte Gavotte ('Spooky' Gavotte), Heinrich Heine's ghostly poem Maria Antoinette is depicted through a suitably eerie arrangement. Der Fischer sees Goethe's ballad of the same title set in an unusual arrangement for harp and mezzo-soprano, while the evocative Wikingerfahrt may have been inspired by Swedish stories about the Viking Frithiof. In all cases, Poenitz's ability to write intuitively for the harp is clear, and given full expression by this accomplished group of performers. Featuring world premiere performances of a number of pieces, this new disc is an introduction to this forgotten composer, and will be of particular interest to harp music enthusiasts. - Includes booklet notes, sung texts and a biography of Franz Poenitz. The booklet notes written by a descendant of Poenitz, Mr Andreas Fischer. - Franz Poenitz was not only a virtuoso on the harp (as is clearly evident in the rich and complex writing for his instrument in this music) but also an accomplished painter, one of his creations adorns the cover of the CD. - The first volume of the Poenitz Edition (works for solo harp played by Laura Vinciguerrra) is also available from Creighton's Collection, Brilliant Classic 94179.